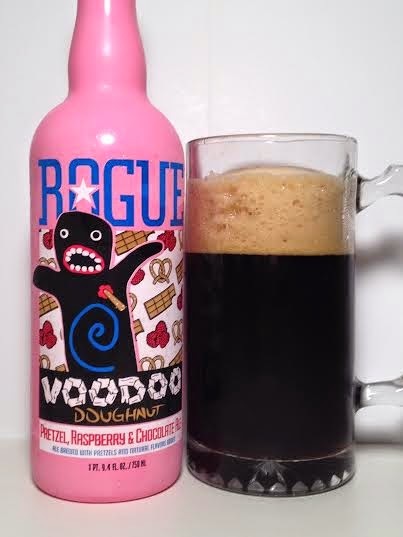 Another entry in the collaboration series between Rogue Ales and Voodoo Doughnut brings us their Pretzel, Raspberry & Chocolate Ale. This is a Brown Ale brewed with pretzels and "natural flavors", which usually means non-authentic, but we won't know until we dive into it. Pours a dark, dark brown bordering on black. Almost an amber/copper/brown color. I got about four fingers of head and then I had to let it settle down before pouring any more. For so much head, it leaves zero lacing. The raspberries are at the forefront of the aroma. It doesn't smell like genuine raspberries either. Also getting a slight nutty flavor. I don't get a lot of chocolate, it's almost the ghost of any chocolate that may have previously resided in the recipe. The taste is...interesting. How to best describe it? Hmmmmmm. As a kid going to the supermarket and on the way out you pass the candy machines. One of them was the hard, fruit-shaped candies of bananas, strawberries, grapes, and other fruit flavors. This is basically the beer version of that. That being said, while I do get the fake flavor of the raspberry, in general, I don't get anything else at all. No chocolate, no pretzel, and just a microscopic presence of raspberry. The beer itself is quite thin despite it's dark appearance with significant carbonation. I mean, for all of the flavors promised, they just aren't there. The pseudo sweetness that is present clings to the back of your tongue on the finish and has you exclaiming "blech!" Pretzel? No. Chocolate? No. Raspberry? Barely. At the end of the day, the Pretzel, Raspberry & Chocolate Ale by Rogue is a mug full of nothing. Granted, it's not repulsive and worthy of a drain pour, but I would never describe it anywhere close to good. The flavors are non-existent and the ones that do show up to the party are about as authentic as a Ryan Braun urine test. Again, not cringe-worthy, but not worth your time either.